A photo of Louise Psarras-Bly taken by my friend Honey Loo. This was at a soap making workshop given in Watertown, NY. Specialty: Natural body products like soaps, lotions, and lip balms. Emphasis on natural! Location: Carthage, NY but also online. She will ship anywhere in the USA. 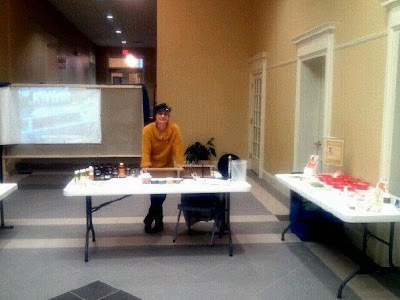 Louise is extremely knowledgeable about soap making, creating cosmetics, and natural ingredients. I was lucky enough to attend her workshop through the Lucky Seven Lecture Series given by the North Country Arts Council in Watertown, NY. She explained her history which included memories of family in Greece making soap and a desire to make natural soap like the kind she was able to find in Belgium before moving to the US in 2000. She’s been making wonderful soap ever since! Louise knows and researches her ingredients. Her soaps are made from lye which, while dangerous, she is very careful to handle. In addition she adds extra virgin olive oil and other natural ingredients, such as minerals, to add color. You can read more about her ingredients, products, and philosophy on her website! 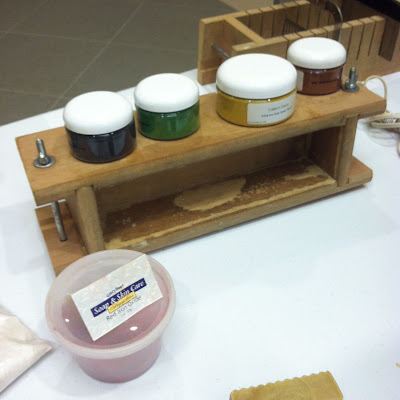 Some of the minerals Louise uses as well as one of the soap molds she made. Photo by Grey Catsidhe. As said, Louise ships all over the USA. She aims to bring natural body care back to everyone. Products are for men and women alike! She can complete large orders if you’re looking for party favors. Earth-centered Pagans should love her natural approach. It’s a great option for a physical pre-ritual cleansing! Fellow artisans are also targeted in that she offers hands-on workshops to actually make soap, body scrubs, lip balm, and more! If you live in Northern NY or are planning to visit the 1000 Islands Region, call her and set up a private or group workshop! Furthermore, when asked if she would be comfortable hosting a group of Pagans to make soap or bath tea, she was definitely willing to have us! Thus far, I have had two experiences with Les Savons de LouLou. The first was the previously mentioned workshop in which I was able to take home several samples of her wonderful soap, including a shampoo bar! I also got patchouli, spearmint, ginger lemon-grass, and one or two other scents. The soaps I’ve used so far, the shampoo soap, ginger lemon-grass, and spearmint, smell divine and foam wonderfully! They leave my skin feeling soft and my hair looks great! Her shop celebrated its one year anniversary last weekend. Weretoad and I stopped in to visit and buy some gifts for family. Her shop is connected to another that she manages called An Eclectic Boutique which sells antiques and locally made goods – jewelry, felt toys, and food! Hubby and I purchased some soaps for family. For myself, I bought a large shampoo bar and a wonderful strawberry-raspberry lip gloss. Natural flavors, oils, and color! And very affordable! I love it and the smell makes me think of summer which is just around the corner. If you wear makeup, it’s a great cosmetic for the light half of the year. Louise was giving out more samples so I grabbed a little bottle of lavender hand lotion. Wow – just wow. The smell is perfect and created with essential oils. Beautiful products! Les Savons de LouLou, while not certified organic or anything like that, is making great strides to be sustainable. The products utilize natural ingredients for color, scent, texture, and suds. Most of her products are vegetarian. Her beer soap, though it smells divine, is not because it’s made with Guinness. She also makes a wine soap but I don’t know which wine she uses or if that brand is vegetarian. I also don’t know if she uses local wine. Louise is always willing to answer questions about her products so I could easily find out. She is able to explain why she uses a product and what health benefits they give. Her soaps are minimally packaged in paper. The lip gloss I bought comes in a small glass container thus it is recyclable. Les Savons de LouLou is a wonderful company. It is very local to me and Louise uses natural and mostly vegetarian and vegan ingredients. She is concerned about what people put into their bodies and wants to bring back the old art of soap making. Festival season is coming up and you don’t want to be a dirty Pagan! Grab some natural soaps to clean up! Super neat! I’m debating doing soaps as well. Need to broaden my shop.